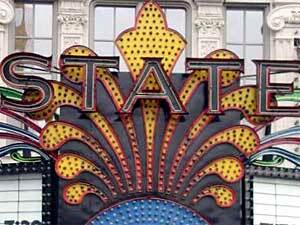 The State Theater on Hennepin Ave.
Join the conversation with other MPR listeners in the News Forum. The future control of three historic theaters in Minneapolis goes before the city council. The decision is mainly between two groups -- a team led by the Ordway Center, and another group made up of the theaters' current operators. It's portrayed by some as a David and Goliath battle between a local non-profit organization and corporate giant Clear Channel. Minneapolis, Minn. — In addition to mid-size rock concerts, the State, Orpheum and Pantages theaters on Hennepin Ave. specialize in touring Broadway-style shows. "The Producers," "The Lion King" and "Aida" have all played here. The city owns the theaters, but for more than a decade the Hennepin Theatre Trust has managed the shows. Trust President Tom Hoch said his company's relationship with media corporation Clear Channel is the reason Minneapolis gets those shows. "Because they are such a big entity, they are either an investor in the show or are responsible for routing the show," Hock said. "They work on that with us to make sure that, in Minneapolis, we get these shows early and they're the best shows." Hoch, Clear Channel and the Historic Theater Group make up a team that's currently favored to win the theater contract. They've presented a proposal to continue their current operation, with the major change of buying the three theaters. St. Paul's Ordway Center proposes forming a regional alliance, moving some business operations to Minneapolis and booking the touring shows itself. The Ordway alliance would rent the theaters with an option to buy. Ordway board member David Lilly painted the decision as a choice between a community-driven, non-profit and the big dogs of the entertainment industry. "Clear Channel has, I think, an economic interest in presenting primarily its so-called Broadway product, to the exclusion, often, of other important things," Lilly said. Those other things, he said are education programs for school kids and access for local theaters, for instance. In addition, money that would otherwise go to a corporate middleman for booking stays in the Twin Cities, keeping ticket prices lower and generating funds for local shows. "How many times are we going to bring 'Rent' back to town, or 'Les Miserables' or 'Phantom (of the Opera)?'" Lilly asked. "Or is there some other use that will give Minnesota audiences access to wonderful musical theater that we call Broadway -- and other great things?" The Ordway is getting lobbying help from a loose-knit collection of theater organizations called the Independent Presenters Network. Its members tout successes outside of the corporate booking structure created by companies like Clear Channel. David Fay is Director of the Bushnell Center for the Performing Arts in Hartford, Connecticut, and a member of Independent Presenters. He supports the Ordway's argument that it's better to unify the theater market, than to create more competition. Clear Channel has, I think, an economic interest in presenting primarily its so-called Broadway product, to the exclusion, often, of other important things. "Whoever bids the highest ends up with the show, and then they price the tickets afterwards," Fay said. "In our business, in this entertainment business, that kind of competition hurts the consumer." Fay echoed concerns about re-deploying money back into programs rather than paying an outside company. But Hennepin Theater Trust's Tom Hoch said in addition to putting on good touring and local shows, since the early '90s his partners have driven a revitalization of Hennepin Ave. into a theater district. "We have been here operating these theaters for a long time, and are very committed to Hennepin Avenue and its success -- and I think we've demonstrated that," Hoch said. Theatre Trust's partner, Historic Theater Group, is responsible for the painstaking renovations of the three theaters and have managed to operate them in the black. City Council Member Scott Benson is a member of a study group that picked the Theatre Trust proposal. He said their work downtown has made them many friends. "On the question concerning ability to work with community and community arts organizations, they certainly scored the highest of the three for me," Benson said. The full City Council makes the final decision.